Download "BY-LAWS OF THE EDWARD J. BLOUSTEIN SCHOOL OF PLANNING AND PUBLIC POLICY. Rutgers, The State University of New Jersey"
1 1 By-Laws BY-LAWS OF THE EDWARD J. BLOUSTEIN SCHOOL OF PLANNING AND PUBLIC POLICY Rutgers, The State University of New Jersey Article I. PREAMBLE These by-laws, prepared and adopted by the faculty of the Edward J. Bloustein School of Planning and Public Policy, effective September 30, 2001, and any subsequently adopted changes and amendments, are intended to govern the affairs of the school in accordance with the several articles that follow. These provisions shall not be suspended except by way of the amending procedure specified in Article VIII. The by-laws, and any amendments thereto, shall be consistent with all currently applicable sections of University Regulations and Procedures. In the event of any conflict or inconsistency, the University Regulations and Procedures shall prevail. The Edward J. Bloustein School of Planning and Public Policy was established in the 1992 school year. Most of the units within the school moved into the Civic Square Building in 1995, and several new centers were established within the school since its creation and the move into its current quarters. 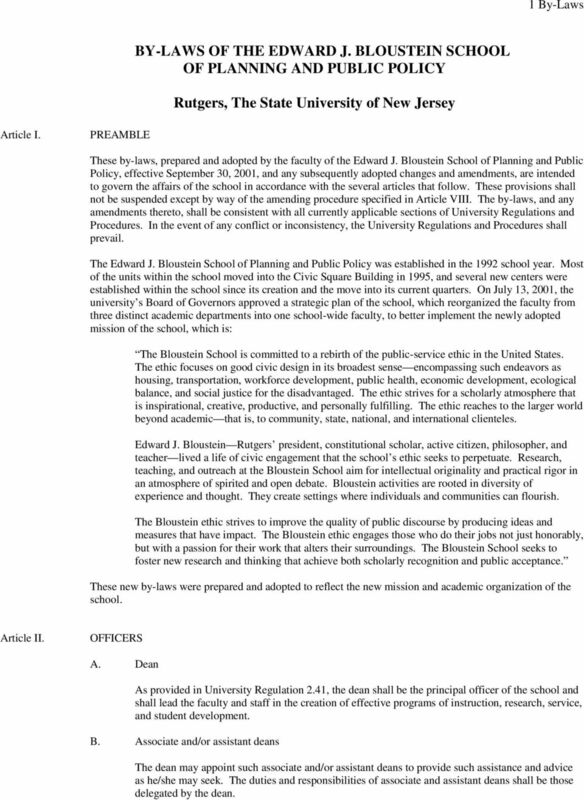 On July 13, 2001, the university s Board of Governors approved a strategic plan of the school, which reorganized the faculty from three distinct academic departments into one school-wide faculty, to better implement the newly adopted mission of the school, which is: The Bloustein School is committed to a rebirth of the public-service ethic in the United States. The ethic focuses on good civic design in its broadest sense encompassing such endeavors as housing, transportation, workforce development, public health, economic development, ecological balance, and social justice for the disadvantaged. The ethic strives for a scholarly atmosphere that is inspirational, creative, productive, and personally fulfilling. The ethic reaches to the larger world beyond academic that is, to community, state, national, and international clienteles. Edward J. Bloustein Rutgers president, constitutional scholar, active citizen, philosopher, and teacher lived a life of civic engagement that the school s ethic seeks to perpetuate. Research, teaching, and outreach at the Bloustein School aim for intellectual originality and practical rigor in an atmosphere of spirited and open debate. Bloustein activities are rooted in diversity of experience and thought. They create settings where individuals and communities can flourish. The Bloustein ethic strives to improve the quality of public discourse by producing ideas and measures that have impact. The Bloustein ethic engages those who do their jobs not just honorably, but with a passion for their work that alters their surroundings. The Bloustein School seeks to foster new research and thinking that achieve both scholarly recognition and public acceptance. These new by-laws were prepared and adopted to reflect the new mission and academic organization of the school. Article II. OFFICERS A. Dean As provided in University Regulation 2.41, the dean shall be the principal officer of the school and shall lead the faculty and staff in the creation of effective programs of instruction, research, service, and student development. B. Associate and/or assistant deans The dean may appoint such associate and/or assistant deans to provide such assistance and advice as he/she may seek. The duties and responsibilities of associate and assistant deans shall be those delegated by the dean. 8 8 By-Laws C. Meetings Dean Associate deans 4 program directors 3 center directors (appointed by the dean) 4 faculty members including 2 senior and 2 junior members (elected by Faculty Council) 3 administrative-clerical staff including 2 administrative professional and 1 clerical (elected by administrative and clerical members of Congress) 4 students, including 1 Ph.D., 1 public policy masters, 1 urban planning and policy development masters (appointed in consultation with the student governing body), and 1 undergraduate student (selected in consultation with the undergraduate students (selected in consultation with the undergraduate organizations). The committee shall meet 6 8 times annually. D. Committee chair The chair of the Steering Committee shall be elected by the members of the committee for a one-year term at its annual organizational meeting. E. Minutes of the meetings shall be distributed to the entire school. 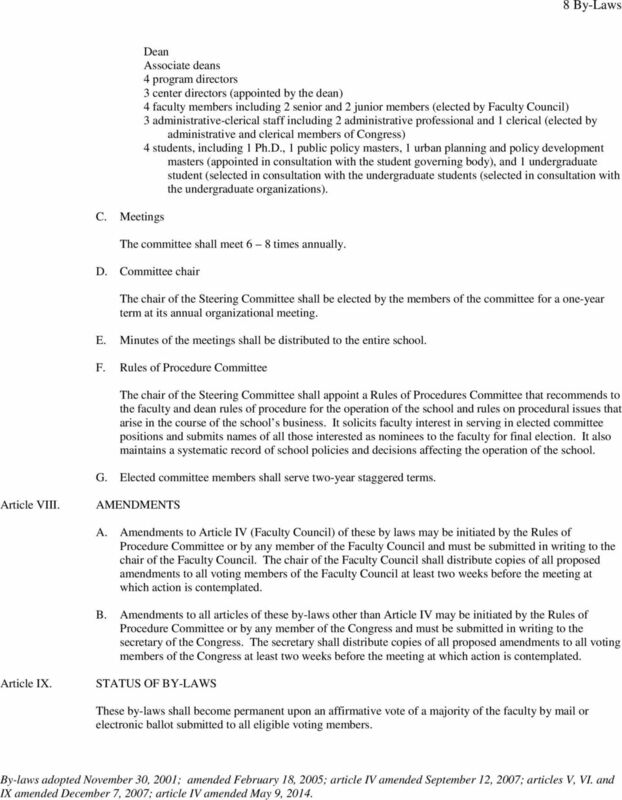 F. Rules of Procedure Committee The chair of the Steering Committee shall appoint a Rules of Procedures Committee that recommends to the faculty and dean rules of procedure for the operation of the school and rules on procedural issues that arise in the course of the school s business. 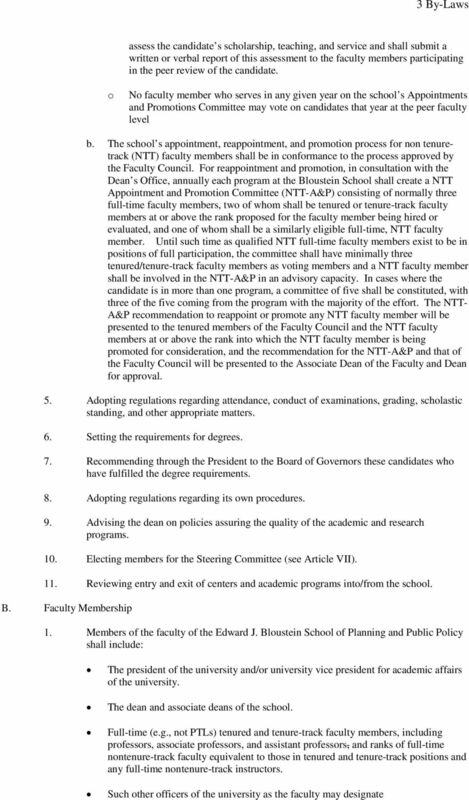 It solicits faculty interest in serving in elected committee positions and submits names of all those interested as nominees to the faculty for final election. 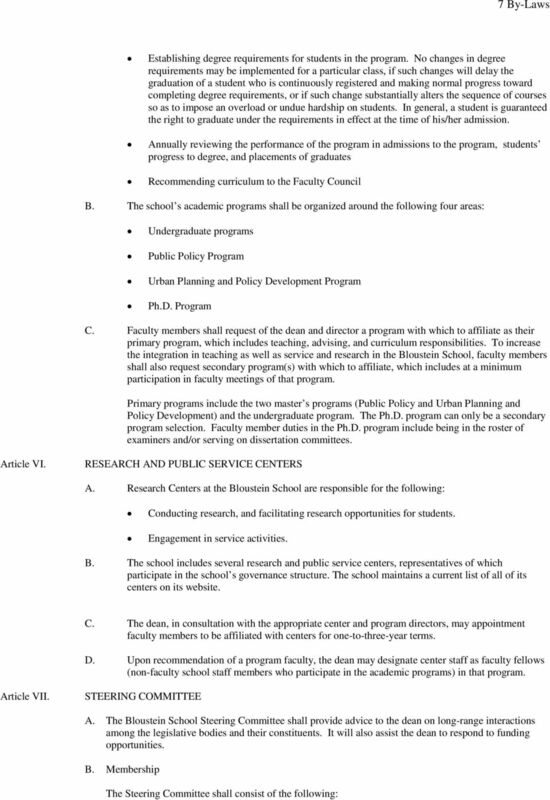 It also maintains a systematic record of school policies and decisions affecting the operation of the school. 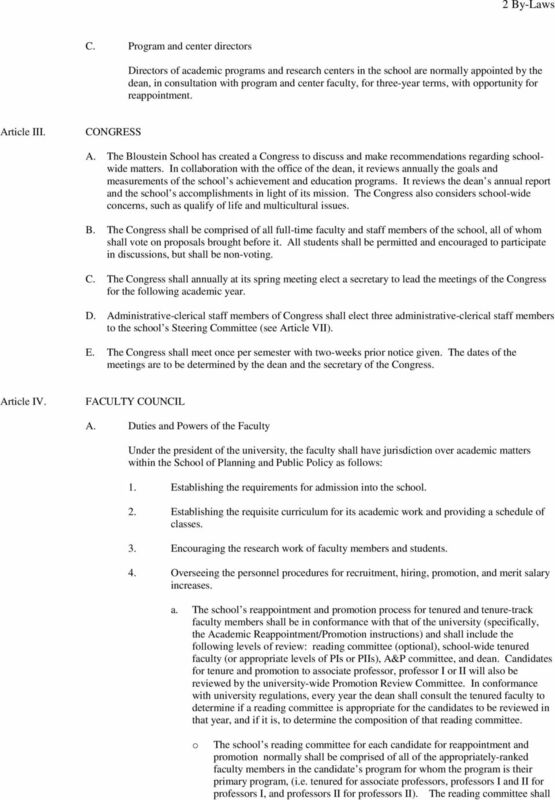 G. Elected committee members shall serve two-year staggered terms. Article VIII. AMENDMENTS A. 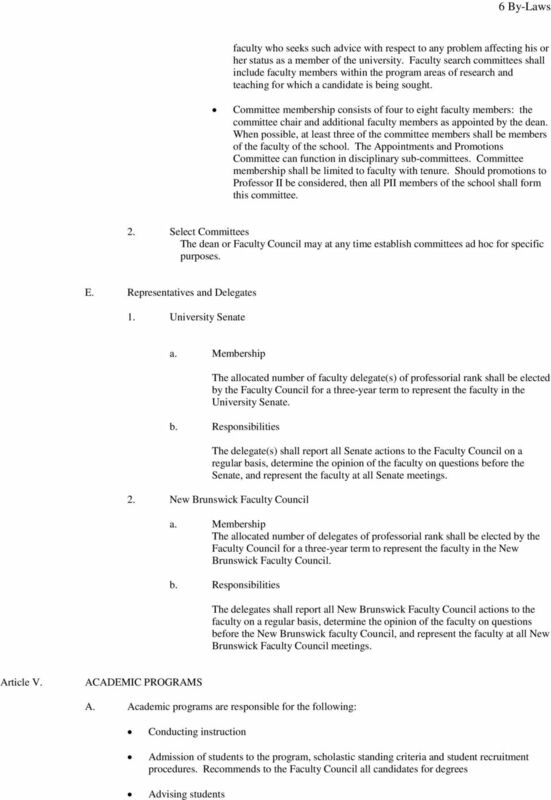 Amendments to Article IV (Faculty Council) of these by laws may be initiated by the Rules of Procedure Committee or by any member of the Faculty Council and must be submitted in writing to the chair of the Faculty Council. 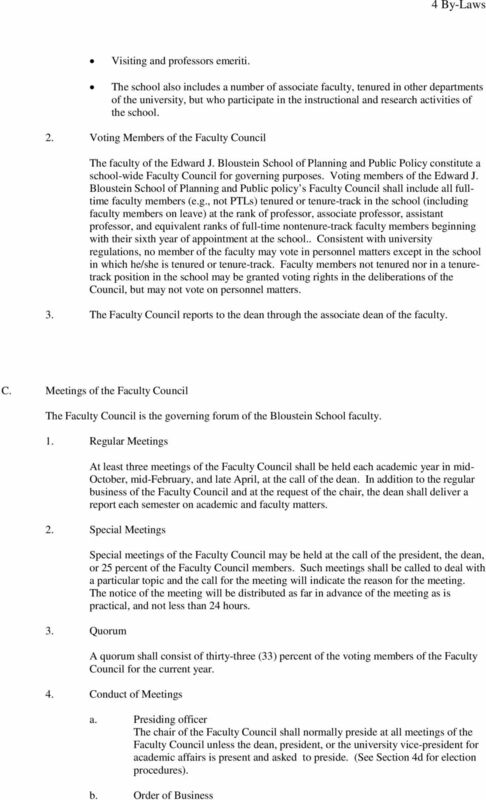 The chair of the Faculty Council shall distribute copies of all proposed amendments to all voting members of the Faculty Council at least two weeks before the meeting at which action is contemplated. B. Amendments to all articles of these by-laws other than Article IV may be initiated by the Rules of Procedure Committee or by any member of the Congress and must be submitted in writing to the secretary of the Congress. The secretary shall distribute copies of all proposed amendments to all voting members of the Congress at least two weeks before the meeting at which action is contemplated. Article IX. 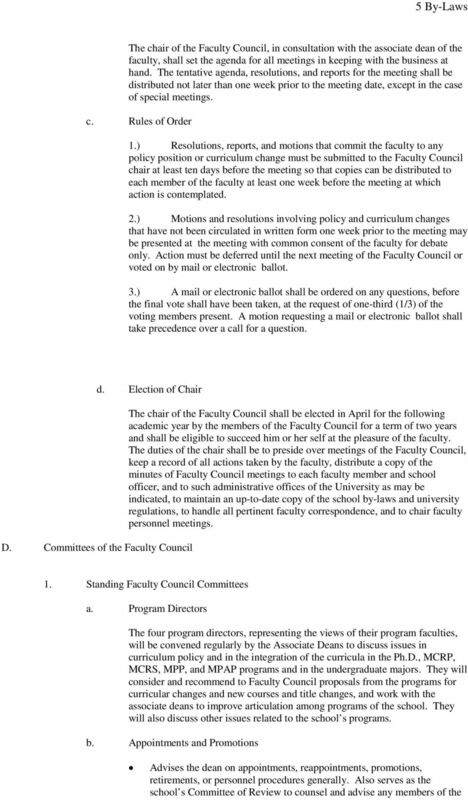 STATUS OF BY-LAWS These by-laws shall become permanent upon an affirmative vote of a majority of the faculty by mail or electronic ballot submitted to all eligible voting members. By-laws adopted November 30, 2001; amended February 18, 2005; article IV amended September 12, 2007; articles V, VI. and IX amended December 7, 2007; article IV amended May 9, 2014.